I wanted to put our Thankful Tree up on November 1st, but we finally hung it on the back of our front door Monday. In case you can’t tell from the photo, I drew a tree on a large sheet of brown kraft paper that had been used as packing material in a box we received. (Extra “green” points for recycling!) 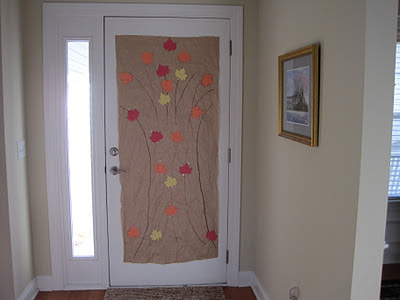 I found leaf patterns online; the girls traced them onto construction paper, I cut them out, and we got busy writing on the leaves things for which we are grateful. In fact, I already need to make more so that we can fill up our tree! Leaves the girls have added include family, salvation, seasons, books, and laptops. Some of my own contributions are prayer and sisters – for their sake and mine, since my sweet sister celebrated her birthday yesterday. I hope to make this a Thanksgiving tradition – and it’s one that won’t pack on the pounds like the Old Fashioned Thanksgiving Stuffing and Strawberry Pretzel Salad that I plan to make next week! What a sweet idea. I love how visual it makes the things you're grateful for. We keep a gratitude journal that we fill out around the dinner table to encourage an attitude of thanksgiving. What a great idea! I hope I remember to do this next year; I just have too much on my plate right now.